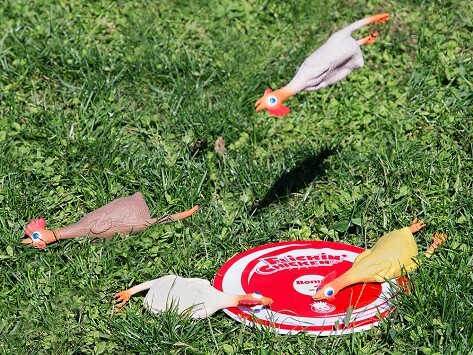 Flick the fun up a notch with this rubber chicken game. Bounce, roll, and toss them at the target. 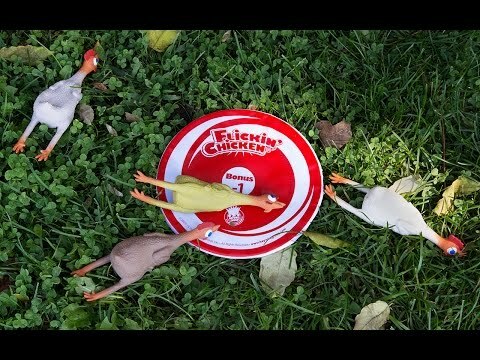 After nine rounds, the player with the lowest score wins the chicken competition. Get friends and family to flock together for some traditional Flickin' Chicken or make up your own version of the game. Dimensions: 10.5" x 10" x 2.5"
East costume: Went as Chicken cordon blue. Tied the chicken onto me with an extension cord. Rally your friends and family for some flickin fun. Don’t chicken out.